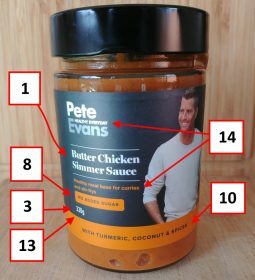 Prescribed Name, Name or Description of Food – This product Pete Evans does not have a prescribed name as perStandard 1.2.2-2 (1)(a) Information requirements – food identification. Otherwise it requires a name or descriptionto be sufficient to indicate the true nature of the food. In this case ‘Simmer Sauce’ is the name andthe description ‘Healthy meal base for curries and stir-frys’. The type of simmer sauce is ButterChicken. Company Name and Address – Clearlystated on the label Ozganics Australia and full address given. Weights and Measures Declarations – Thissection falls under the National Trade Measurement Regulations 2009. In relation to food, this regulation sets outwhat unit of measure to use (mass, volume etc) and the marking of themeasurement. For this product themeasurement marking is 330g and needs to comply to division 4.4 which outlinesthe requirements, position, set-out (how many mm from the package limits) andcharacter size. Directions of Use and Storage – Due tohealth or safety reasons storage conditions are given as instructionsrefrigerate after opening. Use within 5days. Although not required to have adirection of use as it is not a health or safety issue to open the jar andconsume right away. However a servingsuggestion is given for Pete’s butter chicken recipe. Country of Origin – Correct as per the‘Country of Origin Food Labelling Information Standard 2016’. It has on the jar ‘Made in Australia from atleast 70% Australian ingredients’. Itfollows the style guide and in the correct format. Nutrition, Health and Related Claims –This product has a claims on the front and back of the label. On the front of the label and the tamperproof tag from the lid to jar base has the words ‘No Added Sugar’. Under standard 1.2.7 – 12 Nutrition, healthand related claims in S4-3 the food property is listed in column 1 whichrequires a specific descriptor column 3 ‘No Added’ and the conditions that mustbe met column 4. The conditions for ‘NoAdded Sugar’ are the food contains no added sugars (in the standard meansmonosaccharides and disaccharides), honey, malt or malt extracts andconcentrated fruit juice. Reviewing theingredient listing this product meets the requirements for a ‘No Added Sugar’claim. On the side of the label is theclaim ‘Gluten & Dairy Free’. Looking at ‘Gluten Free’ claim using the samestandard list as above S4-3 to be ‘free’ the food must not contain detectablegluten, oats or cereals. As per FoodStandards Code 1.2.8 Nutrition information requirements 1.2.8-6 (iv) What mustbe on the nutrition information panel must be the name and average quantity ofany other nutrient in respect of which a claim requiring nutrition informationis made. To provide clarity on this1.28-4 definitions claim requiring nutrition information (a)(i) a nutritioncontent claim. Reviewing the labelnutrition information panel gluten values is absent which will be covered inpoint 9 below. The next claim on theproduct is ‘dairy free’. This claim doesnot fall under a nutrition content claim as per section 1.1.2-9definition. This claim falls under theACCC as the statement needs to be accurate and not mislead consumers. 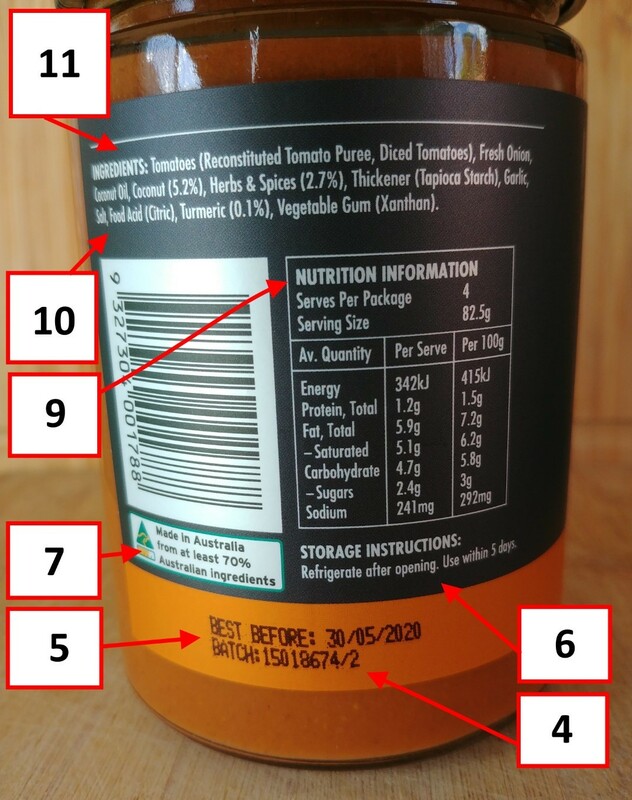 Nutrition Information Requirements –The nutrition information is clear andconforms to the food standards code 1.2.8 on the back of the label. The per serve value for Carbohydrate andsugar should have been rounded up to 4.8g and 2.5g as the serving size is82.5g. Due to the use of the nutritioncontent claim ‘gluten free’ this needs to be included in the nutritioninformation panel as per S12 -2. What isnot clear if the words ‘not detected’ in the nutrition information panel isacceptable or should you follow theexample 1.2.8-6 (6) and use the symbol ‘0’ which is required for the absence ofdietary fibre. Given the amount of‘gluten free’ foods on the market this needs to clear in the foodstandards. 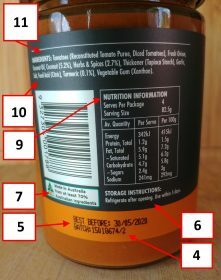 Characterising Ingredients and Componentsof Food – On front of label is ‘with turmeric, coconut & spices’ as perstandard 1.2.10 these characterising ingredients are emphasised on the label ofthe food in words. The declaration ofthe characterising ingredients must be declared as a percentage 1.2.10-8 whichcan be found in the ingredient list (turmeric 0.1%, coconut 5.2% & Herbs& Spices 2.7%). Grouping ‘herbs’with the spices for the declaration of characterising ingredients is not clearand should be listed separately. 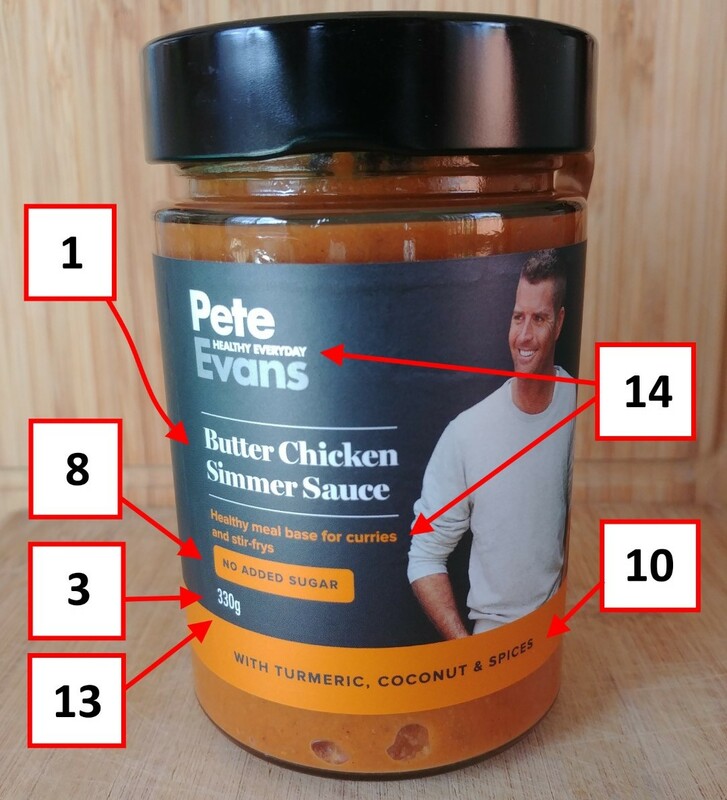 List ofIngredients – Following standard 1.2.4 information requirements statementof ingredients Pete Evans Butter Chicken Simmer Sauce complies. The ingredients are listed by common,descriptive or generic names and appear to be in descending order of ingoingweight. This product contains foodadditives which have followed S7-2 food additive class names ‘thickener’ andoptional class names ‘vegetable gum’ with the name followed in brackets. Warning and Advisory Statement – Doesnot apply to this product. LegibilityRequirements – The characters size 4.12 section in relation to the PeteEvans Butter Chicken Simmer Sauce conforms to the standard as 330g is printedin a colour that provides a distinct contrast with the background colour andover 4.8mm in height. MarketingClaim – This product has a few marketing claims that fall under the ACCCTrade Practices act. 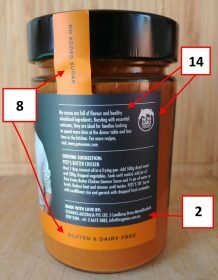 The Non GMOCompliance Australia logo on the side of the jar is a food type assurance claimwere a specific system or process has been put in place to provide assurance tospecific consumer groups. From thewebsite this group is a not for profit organisation and business have to meettheir standards (and pay!) to be able to use the logo on the packaging. On thefront label is the branding Pete Evans ‘Healthy Everyday’ and the copy ‘Healthymeal base for curries and stir-frys’ the word ‘healthy’ for consumers must notbe mislead, deceive or be false. Howwould you know if this was a ‘healthy’ meal base? On the back of the label has a similarstatement ‘My sauces are full of flavour and healthy wholefood ingredients’ theuse of the word wholefood ingredients could be misleading as it is statementsaying all ingredients are ‘wholefoods’ or that it contains ‘wholefoods’. As the process for tapioca starch and xanthanare far from ‘wholefoods’. 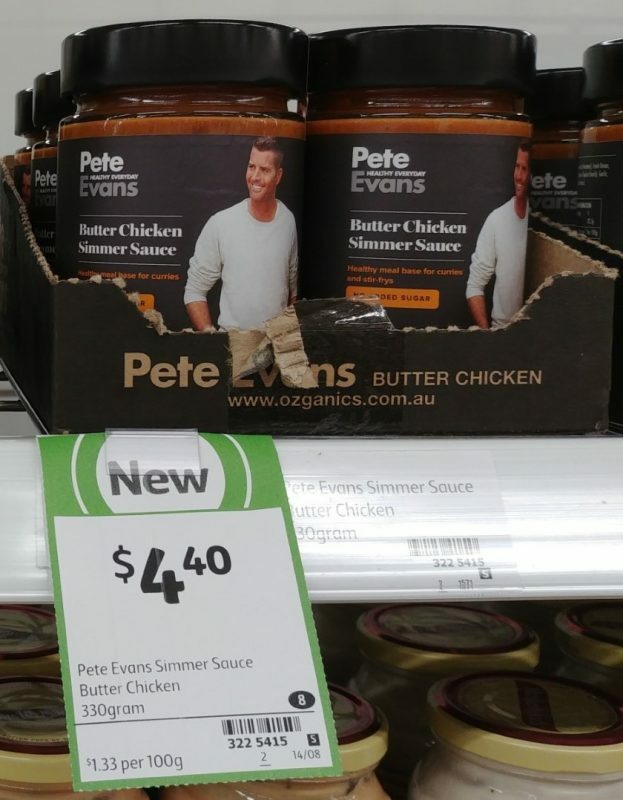 This entry was posted in Food Labelling Review – Australia and tagged Coles, Pete Evans, Simmer Sauce on 10/12/2018 by KS.